You can choose to do some or all of these steps. 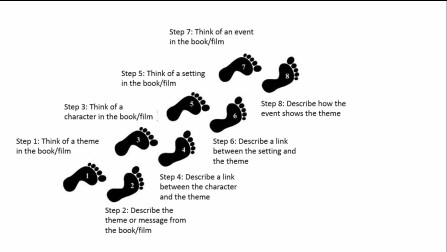 Discuss with your teacher how many steps you should do for your ability level. One idea shown in the film The Goonies was that you should always be hopeful about the future. The message of hope was shown in the film because the Goonies gang always hope that they will find the treasure so that they can stay living in Astoria. One character in The Goonies is Mikey. One of Mikey's characteristics is his optimism. Mikey is the story's protagonist and is central to the plot, just as hope is a central message of the film. He is always hopeful about the future and encourages the others to stay positive too. One setting in The Goonies is the weather on the beach. The characters look out over a cloudy and grey looking ocean as they try to solve the problem of the treasure map. Later in the film, when they have found the treasure and returned safely from their adventure, they gather on a sunlit beach with their families around them. The director uses the weather on the beach to show the theme of hope because earlier in the film there seems to be no hope for The Goonies so the weather is cloudy and gloomy. Later on, when the Goonies are safe and have secured the treasure and their future, the sun comes out and makes everything seem more shiny and happy. So we see that they have realised their dreams and their hope was justified. An event in The Goonies that makes us think of hope is when Chunk manages to escape from the Fratelli's restaurant. When Chunk escapes, the audience feels hopeful that he will be able to raise the alarm and rescue the other Goonies as they are trapped in the Fratelli's hideout. However, Richard Donner, the director, has already shown several scenes about how clumsy Chunk is and this creates tension which makes us wonder whether it will work out for the best. The audience knows that Chunk is doomed before he gives away to Jake Fratelli that he and the Goonies are aware that the restaurant is a criminal hideout.